The first design item that should be considered in a bathroom or kitchen remodeling project is the countertops. This is especially true of kitchen areas with a large island, as the color and materials used in your countertops often serve as the basis for the rest of your room’s look. Choose a countertop material that not only looks great but is also durable and easy to clean to give your kitchen or bathroom a long-lasting makeover. 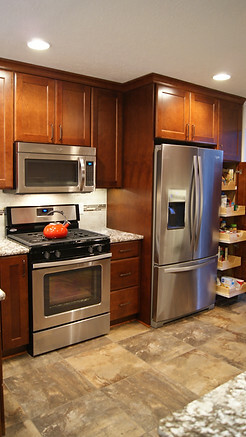 Cabinets are another design feature that should be decided on fairly early in the remodeling process. Since cabinets are typically at eye level in kitchens and a prominent feature in most bathrooms, they’re one of the first things people notice upon entering a room. In some cases, you may also wish to install a new floor during your kitchen remodeling. When selecting colors and materials for these and other features, take into account the other materials being used in your room. Visual contrast is usually a good thing, but you don’t want to end up with a clashing color scheme. As exciting as it may be to focus on selecting materials and colors for your remodeling adventure, you shouldn’t forget the practical side of things. Smaller sinks may seem like a great option for your bathroom, but you don’t want to be left with insufficient storage space. Carefully consider how you will use the room before finalizing any design decisions. Whether you need help with a large-scale bathroom remodeling project or kitchen remodeling work, the expert team at New Leaf Remodeling can help your home look better than ever. To learn more about their services, visit them online, or call (815) 904-6006.